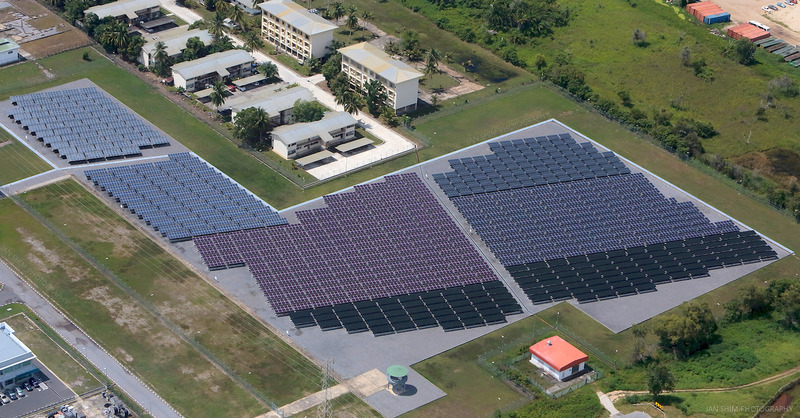 One of the solar arrays at the TSB. Many of you might not know this, but we do have our own solar farm right here in Brunei and it's been in operation since 2010. This B$20 million solar farm is named 'Tenaga Suria Brunei (TSB)' and is located in Seria. With a nominal capacity of 1.2 kWp, the farm covers an area of about 12,000 m2 with exactly 9,234 pieces of solar panels! It has been reported that this farm is capable of providing power to approximately 200 households, that is a total of 1,344 megawatt-hours of electricity per year. That's also equivalent to 46 - 47 pieces of solar panels for each house. In terms of the reduction of carbon footprints, the farm is expected to save approximately 340,000 litres of crude oil and reduce 960 tonnes of carbon monoxide emission annually, equivalent to the CO2 absorption power of 260 hectares of forest. An aerial view of the TSB site. It's also dubbed as the largest demonstration solar farm in Southeast Asia. Why demonstration? Well, apart from lighting up part of Kuala Belait it's being used by scientists for research purposes. The farm consists of six different types of solar modules such as the commonly used mono-crystalline and polycrystalline silicon as well as the newer generation thin films and metal types such as amorphous silicon (a-Si), micro crystalline (nc-Si), Copper Indium Selenium (CIS) and Heterojunction with Intrinsic Thin Layer (HIT). Single or Mono Crystalline Silicon solar cells. Copper Indium Selenium (CIS) solar cells. The mono crystalline or single crystalline silicon (sc-Si) and polycrystalline or multi crystalline silicon (mc-Si) solar modules are known as the first generation PV modules as they are the more mature technology and more dominant. They are widely used for residential and commercial scale solar farms. Due to extensive research and development over the years, these generation of modules are now able to achieve very high efficiency of above 20%. As pure silicon is used in the manufacturing, they require energy intensive processes, hence, overall production cost are relatively higher than other solar cell technologies. So what are the differences between the single crystalline silicon and the poly crystalline silicon solar cells? Single crystalline silicon cells are made from single large silicon crystals. Compared to other PV cells, they exhibit higher efficiency but tend to lose efficiency at high temperatures. The production costs are highest, since it involves a complex, energy intensive process. They have high longevity and durability. This type of solar modules are the most widely used all over the world. Poly crystalline silicon cells are composed of multiple silicon crystals. Since the production process is relatively simpler then single crystalline silicon cells, the costs are comparatively lower. The poly crystalline silicon modules are however slightly less efficient than the single crystalline but the durability and longevity are comparable to single crystalline PV modules. As they come at a lower price and a comparable performance, poly crystalline silicon PV modules are currently becoming the more popular choice in the market. However the unit cost per energy conversion are similar for both mono and poly crystalline solar modules. The main difference is, mono crystalline solar modules require a smaller surface area than poly crystalline solar modules to convert the same amount of energy. So it all comes down to how much land or rooftop area you have available when choosing between the two. This generation of PV modules refer to the emerging thin film technologies such as the amorphous (a-Si), copper indium selenium (CIS), the hybrid micro crystalline (nc-Si/a-Si) and HIT solar modules. Amorphous silicon (a-Si) is a non-crystalline form of silicon. The panels are formed by depositing a thin layer of silicon on a substrate material. The micro crystalline module here refers to a hybrid technology combining the micro crystalline cells (nc-Si) with an a-Si cell. HIT consisted of a thin sc-Si surrounded by ultra-thin a-Si while CIS is a solid state semi conductor copper indium selenide (CuInSe2). Although material and production costs are lower than the first generation solar cells as they require less or no silicon, their lower efficiencies creates a setback resulting in lower demand and modest productions, hence retails prices are more expensive. Their degradation characteristics are also less understood. Among its advantages are its flexibility and light-weight; suitable for residential or building integration (i.e., BIPV). Thin film technologies are also less affected by shading as different materials with different absorption properties are layered atop one another to enable absorption of multiple light spectrums (both long and short wavelengths). This video is taken during one of our visits to the solar farm. Our General Manager is one of the few scientists who are currently doing research on solar photovoltaics at the TSB as part of her PhD requirement. You can read more about her research here.